Soccer’s World Cup tournament, now getting underway, is front-page news around the world. But why should the sports world have all the fun? The infographics whizzes at The Wall Street Journal adapted the Cup’s group-and-bracket format to show which of the 32 countries in the tournament stand out on 70 dimensions, only a handful of them related to soccer. 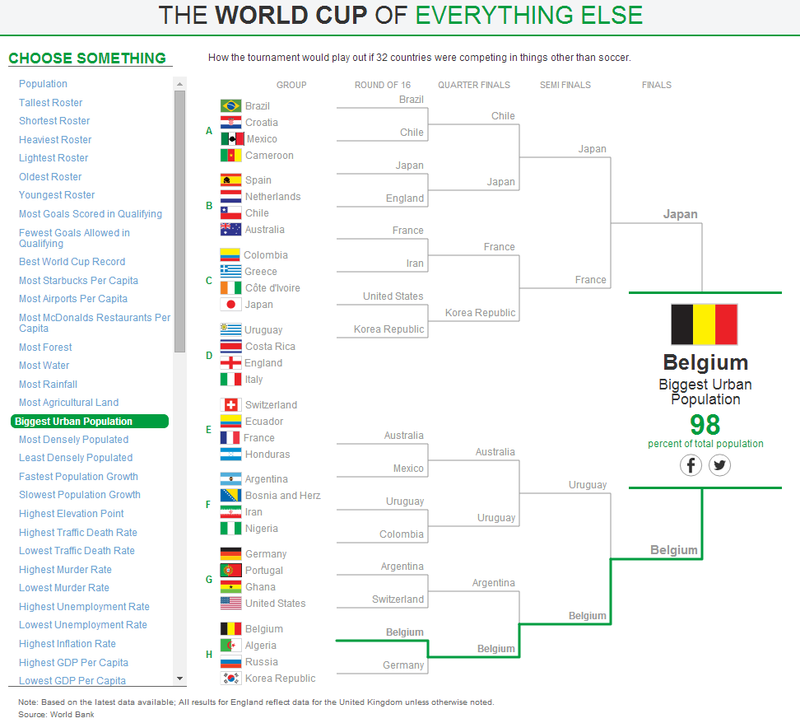 On the interactive version of the chart, clicking on any of the topics in the left-hand rail automatically reorders the brackets and picks the “winner.” We learn, for example, that Russia leads the World Cup qualifiers in most cellphone subscriptions per capita (1.84), Argentina has the heaviest meat-eaters (570 calories per capita per day, beating out the French), and the Netherlands has the highest internet usage rate (93% of its population is online). It’s a simple and elegant, yet compulsively fascinating way of presenting a lot of data about the world.